Reflecting back on 2017 we recall the memory of Jack Shirreff, who established and ran 107 Workshop, a unique collaborative print workshop in Wiltshire, England. The workshop offered the complete range of printmaking processes with experimentation at the root of it’s brilliance. 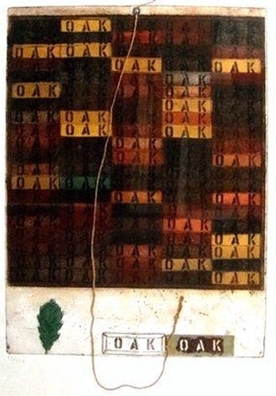 In 1981, Shirreff and the British Pop artist Joe Tilson collaborated in creating the Oak Mantra etching which was the first fine art print published by David Krut. Through the 1980’s Krut introduced young artists to 107 Workshop. These were; Chris Cook, Lance Smith and Ansel Krut who were post graduates with studios at the Royal College of Arts, and also other young artists based in the UK. This mentoring process allowed Krut an insight into the workings of an art career and set him on his career which has spanned nearly forty years as a collaborator and mentor for many young and established artists. It was at Corsham that Shirreff first worked with Tilson, who came as a visitor to make prints, at the start of a long-term professional relationship. In 1980, Tilson returned from a stay in Paris, where he had met Henri Goetz, the great pioneer of carborundum techniques in etching. Fired by Tilson’s enthusiasm, Shirreff became a master of carborundum printmaking, which, by adding gritty silica compounds to the printing medium, allowed the artist to apply colour directly to the plate with a brush and to create etchings with painterly effects of impasto and relief.